HomeWhy care about classical music? Why care about classical music? Many years ago when I was still married, my husband asked me if I would have become a musician if my parents hadn’t played instruments. I told him that there was no way to know for sure if my study and lifelong affinity for music would have happened had I not had my early childhood exposure. That answer surprised him a bit. He knew that I grew up with music as a very important part of our family life, a subject I wrote about in my book, Remembering Mom and Dad, in the story entitled Music in the House. He also frequently had to put up with my practicing various instruments for my numerous musical endeavors. After taking a music appreciation college course and dabbling with the piano for the first time, he decided that wasn’t for him. 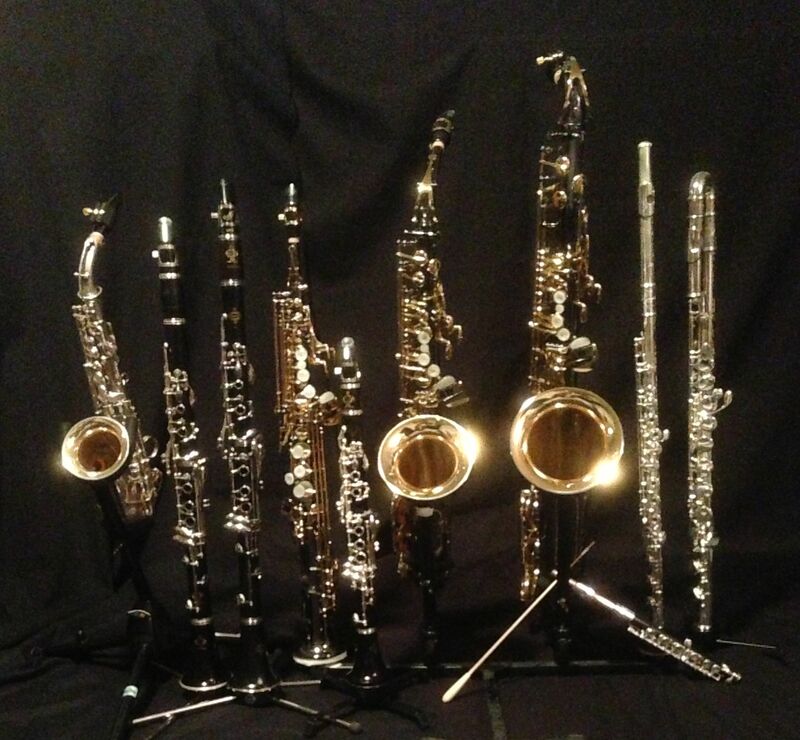 Still, he wanted to learn to play an instrument in self-defense, although he was careful to select something I didn’t play (I play the woodwinds shown above for public consumption along with piano and trumpet for my ears only). He didn’t have any musical training other than that very brief introduction in his music appreciation course, so he found a teacher and started from scratch learning classical guitar. Although he frequently listened to many different styles of music, his interest in playing an instrument started when we were together, so for him exposure as an adult prompted the study. While he didn’t continue playing for very long after we split, those few years of study gave him much greater awareness of the richness and variety of classical music, and in so doing, expanded his level of appreciation for the classical genre. His new awareness allowed him to hear things he had never noticed before, and it deepened his emotional response to all types of music. Despite the fact that nobody in my immediate family viewed being a musician as their primary vocation (Dad was a doctor, Mom was a nurse, and I was an engineer), we all took our music very seriously. We also all began our personal musical development with classical training. All of us started with piano, although my father and I quickly branched out into the woodwind family as our preferred instruments of musical construction, each of us building on our piano foundation. My mother stuck with the piano as her preferred axe and continued playing almost daily for her own enjoyment throughout her life, albeit in the privacy of her home. I am the only member of my immediate family to have continued playing as a performer outside of the living room. There is no doubt that my family’s early musical training had positive effects on other aspects of our lives. The focus we learned in studying music was invaluable both in school and on the job in our professions. That training helped us learn how to learn, and it improved our personal discipline in meeting technical and intellectual challenges. It also gave us each a valuable tool for dealing with stress. Often times, playing our instruments provided an outlet for dealing with frustrations in a productive way and helped us relax. Having studied music can also help in social situations providing a common bond and easing tensions in some unexpected places. Whether or not this was due to our childhood training, much of our musical focus was centered on the classical genre. In 2014, NPR presented a segment on All Things Considered entitled This is Your Brain. This is Your Brain On Music. The segment discussed a study conducted through Harmony Project in Los Angeles that appeared in The Journal of Neuroscience extolling the virtues of studying music. The results showed that studying music not only allowed students to gain proficiency in playing an instrument, it also improved their language processing. That’s not surprising given that music is in itself a language. Beyond the Harmony Project study, there is ample evidence that music plays an essential role in cognitive processing which Oliver Sacks (a world-renowned neurologist and neurosurgeon as well as a classically trained pianist) discusses in his book, Musicophilia: Tales of Music and the Brain. Sacks uses music perception as a diagnostic tool in his practice. Over time, he noticed that certain changes in musical perception were symptoms of specific types of brain injuries or pathologies. He confirmed his observations through clinical studies. Those studies have enabled him to add a very powerful, and non-invasive, toolset to his diagnostic arsenal. That of course applies to music overall, not just classical music, so why should someone care about classical music specifically? As a musician at any level, the biggest benefit to gaining a foundation in classical music is that it provides rigor for developing one’s playing technique. In addition, knowledge of classical music provides an understanding of the language since one of the few defining features of classical music over other genres is the fact that it is written in a universal notation. Granted, that notation has evolved to some degree over the years, and there are still some period-unique stylistic aspects that are learned from a teacher or a style book. Still, knowing those idiosyncrasies allows a musician to play the written music appropriate to the style intended rather than learning all of it solely by rote. The written musical language allows musicians to reproduce the works consistently throughout the ages. Yes, works can be reinterpreted, but they can also be preserved. The written language allows a musician to study the theory governing music more directly. Having command of the musical language is also a skill that enhances a musician’s application of language and cognitive processing in many forms beyond music, in essence expanding their cognitive reach. And of course, when one plays instruments (including their own voice), they are automatically listening to music and gain all the benefits of listening as well. In fact, playing and listening provides a musician with a very effective cognitive workout. Beyond providing a stimulating mental exercise, actively making music can also allow the player to relax in a unique way. It facilitates a type of escape that is simultaneously exhilarating and relaxing based on the player’s brain chemistry. A listener also benefits from classical music. First and foremost, there are significant cognitive benefits just from listening to classical music depending on the work selected by the listener. It can stimulate the brain in a positive way. An appropriate choice of music can energize the listener and help them better execute difficult mental tasks such as test taking. The optimal choice is somewhat listener dependent of course. Listening to classical music can also be cause for great joy. A listener can let themselves get lost in a compelling classical work, and it can trigger very positive emotions. Certain choices can also trigger other emotions such as sadness, anticipation, or fear, again depending on the work selected, but positive or negative, this can be a very powerful way to make a statement that mere words might not be able to convey. Whether the listener is hearing the music live in a concert hall, in a theater watching a live stage production, watching television or a movie, or just listening to a recording at home, classical music can take one on a magical journey. In television and film, often the music is classical in nature, and as such, it drives the audience’s emotional responses, often without them realizing it. Listening can also help soothe people in numerous ways and to different degrees depending on the listener’s selection. It can help calm people suffering from dementia by triggering pleasant memories. It can aid with sleep by helping someone relax and break away from the stresses of the day. It can also allow drivers to remain calm. It can help reduce blood pressure, and finally, it can help reduce pain. Clearly different works would be appropriate for each use, but that’s part of the beauty of classical music. There are numerous styles that can be drawn upon depending on one’s immediate need and preferences. Not all classical music sounds the same. One of the most interesting aspects to it is that in a very real sense, there is something for everyone. The styles vary wildly, and in many cases, people don’t even necessary always recognize it as classical in nature. Classical music developed over several centuries starting c. 500 AD to the present. This includes numerous eras characterized by variations in structure, instrumentation, ensemble size and focus, and even purpose. There is overlap in the timing of some the various eras within the classical music genre (and only one of the eras from about 1750-1820 is technically known as the Classical era overlapping both the Baroque and Romantic eras). In 1500 years, there have been countless works created, covering every situation imaginable. There are classical works that are very jazzy or bluesy – think of Gershwin’s Rhapsody in Blue or Porgy and Bess. There are classical works that are action oriented – think of a John Williams movie score. There are classical works that are intimate, yet dramatic – think of a Beethoven or Brahms piano trio. There are classical works that are extremely mathematical – think of the Bach Inventions. There are classical pieces that are folksy – think of King Henry VIII’s Pastime with Good Company (or The Kynes Balade), etc. In many, but not all classical works, the composer tells a story. 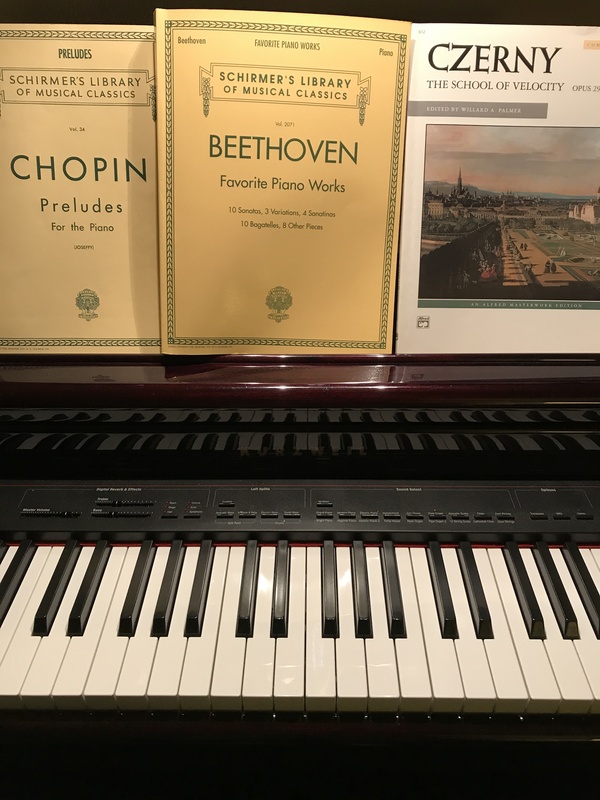 One example that holds special meaning for me is Chopin’s Prelude, Op 28, No. 15, better known as the “Raindrop” Prelude in D flat Major. When I was young, after gaining some piano proficiency, my mother told me the story her piano teacher told her about that particular work when she was first introduced to it. When Chopin wrote that piece, he was on the tropical island of Majorca, delirious with fever. The raindrops were ever present (the theme in the left hand throughout the piece). At one point, he hallucinated a ghost army coming to attack him. The music tells this story very dramatically starting peacefully in a gentle theme in Db Major, the raindrops in the background. After this gentle shower, the music changes. It shifts into C# minor, and the tone turns very menacing and deep. It crescendos to a crushing attack, recedes, and attacks again in a grand fortissimo. A battle ensues, until, eventually, the ghosts leave. The key returns to Db Major, and the opening theme reasserts itself in a gentle recapitulation that slows, decrescendos, and eventually fades out to a pianissimo chord sounding the final raindrop. To this day, playing that piece brings me sweet memories of my mother. That is perhaps one of the most compelling benefits of classical music – because of its repeatability, it can reliably trigger memories for many people. That’s a powerful capability.